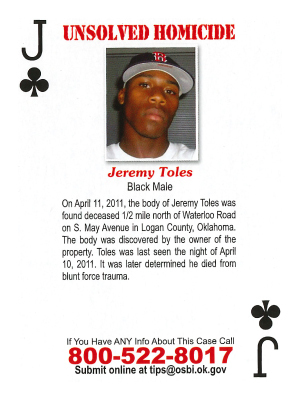 On April 11, 2011, the body of Jeremy Toles was found deceased 1/2 mile north of Waterloo Road on S. May Avenue in Logan County, Oklahoma. The body was discovered by the owner of the property. Toles was last seen the night of April 10, 2011. It was later determined he died from blunt force trauma.